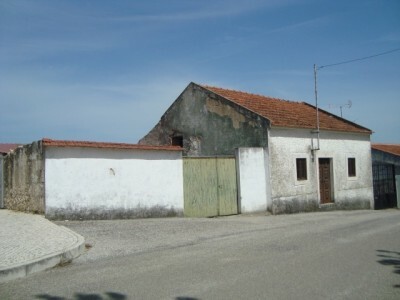 A traditional style four bedroom village house with walled garden for sale in the heart of Pousos, central Portugal. The house, which is set over one floor, is connected to mains electricity and has a well in the garden. The house does require a good deal of renovation work carrying out but could be turned into a cosy holiday hideaway or permanent residence in this popular and well serviced central Portugal village. The house has aluminium framed windows and wooden exterior and interior doors. The main entrance to the house leads into centralised hallway, which runs the depth of the building. The hallway has a traditional style wood panelled ceiling and wooden floor. Off the hallway there are four bedrooms, all of which have wooden floors and ceilings. One of the bedrooms is double aspect and all of the bedrooms also have internal wooden shutters. The living room is also accessed off the hallway and has a wooden floor and ceiling. The living room has a set of part glazed patio doors which lead out to a covered terrace at the side of the house. The kitchen is located at the rear of the house and has a concrete floor. The kitchen has some base level units, a double stainless steel sink and drainer and part tiled walls. The kitchen also has an exterior access door which leads out to a courtyard style garden at the rear. The bathroom is situated adjacent to the living room and though basic is usable. The bathroom has partially tiled walls and there is a pedestal sink, toilet and bidet. There is also a spacious walk in storage cupboard which has a wooden floor and ceiling. At the rear of the house there is also a large adega which has a traditional style wine making vat to one corner. The adega is accessible from both the house and the garden and could be incorporated into the living accommodation with a little work. At the side of the house there is a gated driveway which has a large covered car port, large enough to accommodate several vehicles. There is a walled courtyard style garden to the rear of the house with a selection of mature plants and trees, which can be accessed via a set of wrought iron gates on the side of the house, or from the house itself. The majority of the property’s land is situated beyond this where there is a good selection of mature olive trees and grape vines as well as a number of mature fruit trees. The house is situated in the centre of Pousos, adjacent to the village’s church. The house is set on the road, though enjoys good views at the rear on the land. The house is within walking distance of all of the village’s amenities, which include several cafe bars and a small shop. The larger town of Torres Novas, which has supermarkets, shops, cafes, restaurants, banks, schools, pharmacies, hospital, schools, college, shopping mall and historic castle, is around 11 kilometres away. The historic town of Tomar, home to the UNESCO listed Convento do Cristo, is only around nine kilometres drive. Tomar also has a range of supermarkets, shops, cafes, restaurants, bars, schools, sports and health centres as well as a bus and train station. The closest airport to the property is situated at Lisbon, which is around one and a quarter hours’ by car. Lisbon airport is serviced by a variety of low cost airlines, which operate regular flights into and out of the United Kingdom and other European countries.